Bias-cut duck with special wear resistant rubber made belts tough and extremely flexible. Pre-stretched polyester cord members provide high tensile strength and minimum elongation. 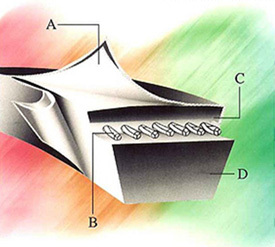 Researched adhesion compounds bond the tensile members in position and the cords to the cushion rubber. High heat resistant and flexible synthetic rubber. First V-belt can transmit 30% to 60% higher horsepower than RMA standards under specified conditions. 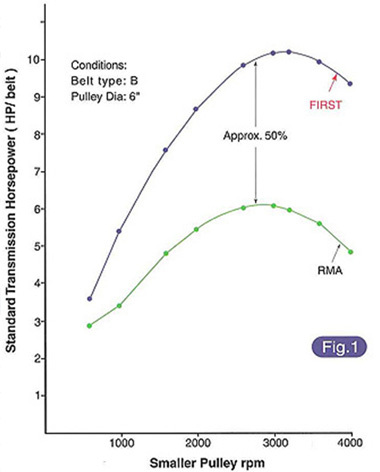 shows the transmission horsepower per belt which is plotted against the smaller pulley rpm, when using a 6-inch pulley and a B section belts.